The configuration of the top search form: Search minivan or minibus vehicles at the rental location 'Linz - Airport'. Address: Car Rental Parking Centre, Flughafenstrasse Nr. 1, Linz, A-4063, Horsching, Linz, Austria. - use the map of Linz. Typical models of the minivan/minibus class in Linz are: Citroen Picasso, Citroen Jumper 8 seater, Citroen C8 Tdi, VW Touran, Peugeot 807 7 seater, Opel Zafira and others. Standard capacity of a minivan in Austria is up to 9 people (8+1 formula), traditionally providing seven or eight passenger seats. The capacity of a minibus may vary from 9 to 15 people. Please note, that in order to rent in Austria a vehicle with capacity which exceeds 8 passengers, you would need a driving license of the corresponding category. Minivan dimensions are quite unusual for an ordinary driver, which sometimes leads to appearance of scratches and dents during unsuccessful manoeuvring or parking. Therefore, we encourage you to order full coverage of insurance franchise during your booking, or directly at the rental office in Linz. Before leaving the parking garage in Linz, inspect the minivan for exteriour defects and other signs of damage together with the office representative and mark the found defects found in your rental documents. OrangeSmile.com wishes you a great driving experience on the roads of Austria! 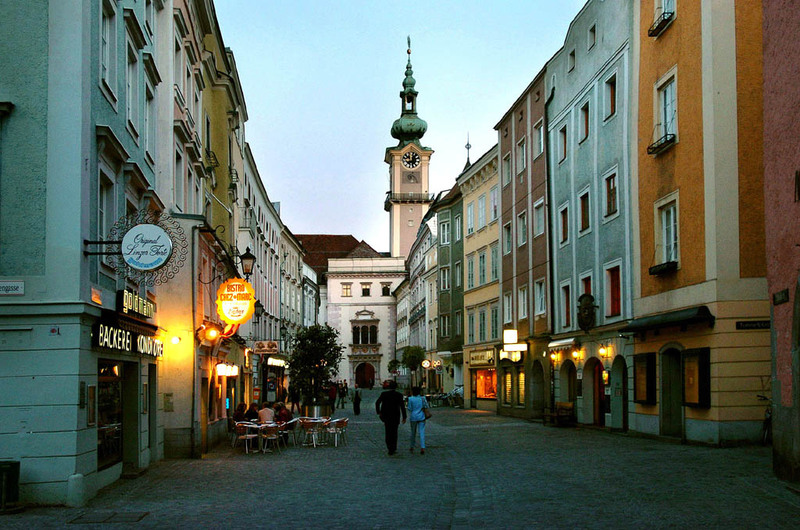 In Austria, there is a strict regulation regarding entering and moving in roundabouts. If there are no other signs, cars that enter the circle have the advantage. Foreign drivers should not forget that there’s an opposite rule in a number of European countries, and the priority is given to drivers who already move in the circle. The maximum allowed blood alcohol content is 0.5 ppm. The violation of this rule will result in a fine from 200 to 5,800 euro. The cancellation of the driving license is a typical additional punishment for this violation. Motorists with the driving experience of less than two years should be extremely cautious when consuming alcoholic beverages. For them, the maximum allowed blood alcohol content is 0.1 ppm. In addition to a large spectrum of attractions, Linz boasts an abundance of entertainment options. Linz is especially popular among fans of shopping. There are some major shopping streets in the city. The main shopping street is Landstrase, where you can find high-end boutiques and perfume shops, jewelry stores, souvenir and antique shops. The large Arkade shopping center is situated there; it serves clients on weekdays. Different shops can be found there, including supermarkets, clothing stores, shops with toys and household appliances. Flohmarkte is the most famous flea market of Linz; it is located on the square in front of the New Town Hall. Vendors offer to acquire the most incredible products; you can find real antiques and antique works of art there. Among shopping centers Plus City also points out. It has an excellent supermarket, as well as a huge amount of clothing and shoe stores for all tastes. Those who prefer to devote time to sports entertainment are recommended to go to the Swingolf Linz golf center. It will please both experienced golfers and beginners, who would learn the game basics in a couple of lessons. Swingolf Linz center is located in a short drive from the city center. It features a well-developed infrastructure. The perfect place for a family holiday is the zoo, which is home to eight hundred animals. Its inhabitants are brought from different parts of the world; they live in beautiful open-air cages that resemble their natural habitat.